(1994) It is said Mr. Honda never liked two-stroke engines. He found the buzzing two-strokes crude and simple, the engineering equivalent of a blacksmith’s anvil. Mr. Honda was if nothing else, he was an accomplished engineer and his fascination was with four stroke, multiple cylinder and multiple valve engines. The first scooters and motorcycles with the Honda name across the fuel tank were two-strokes as an economic issue but soon after Honda Motor Company began its first boom, the engineering slant began to lean towards the more complex four-stroke machines. In racing Mr. Honda had a very definite preference for four-strokes as evidenced by the four, five and six cylinder machines raced by the factory in Grand Prix in the 1960s. MV Agusta were the last manufacturer to win a 500cc Grand Prix with a four stroke, in 1973. Agostini joined Yamaha’s squad and won straightaway on the first Yamaha 500 two-stroke – the OW20. The win heralded a change in the engineering guard in 500 Grand Prix: intake valves and camshafts were dead. Suzuki, Kawasaki and Yamaha all raced in the 500 class with multi-cylinder two-stroke machines, and in this period it wasn’t an unpopular thought that a four stroke, any four stroke, would be noncompetitive against the light and powerful two-stroke machines. 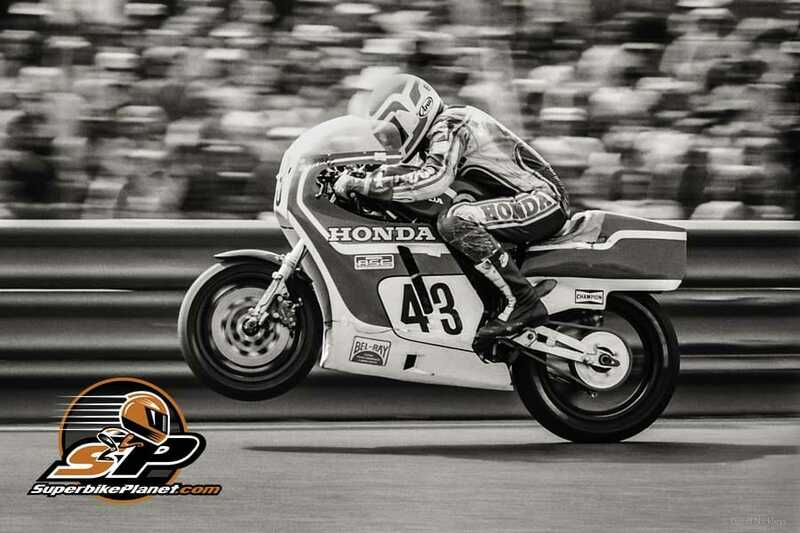 HRC and Honda stepped out of Grand Prix in the 1960s but stepped back in by the late 1970s. Moreover, in 1982 Honda released two Grand Prix machines that they hoped would return four-stroke engines to the forefront of Grand Prix technology: the FWS1000 and the NR500. The NR500 oval piston machine was designed immediately to go to Grand Prix but the FWS1000 had a design goal of winning the Daytona 200 and the AMA F-1 championship. The NR failed at its goal of winning a 500 championship; it never scored a single 500 world championship point. The FWS succeeded in AMA Formula One. Eventual five-time AMA Formula One champion and three-time Suzuka eight hour winner Michael Baldwin netted his American Honda FWS ride in a unconventional way: by way of the bottle. He raced and won the first Suzuka eight hours endurance race on a Yoshimura Suzuki with Wes Cooley by bringing over a small number of Goodyear race tires to use instead of the normal Dunlop and Michelin rubber. Honda as usual had a slew of race teams at Suzuka yet the Baldwin and Cooley pairing dominated the race with the Goodyear rubber, brought over as Baldwin’s checked luggage on the plane. “We led the whole race I think,” says Baldwin. “It wasn’t like a bunch of bikes crashed and then we won. I do remember that race because one of the Hondas crashed coming onto the front straight and it burst a ball of flames as it tumbled. It was pretty cool.” A long time Japanese engineer Mr. Michihiko Aika, (who was one of Mike Hailwood’s Honda mechanics in the 1960s) oversaw all of the Honda racing efforts and met with Baldwin later in a bar. “He said, ‘I know where we can get some good whiskey’ and we went to this bar and got plastered.” The two drank heavily and Aika (Eye-ka) hinted that he would hire Baldwin for Honda’s factory endurance racing effort, the French Honda Endurance team the next year, then and now one of the best endurance teams in the world. The problem was that the French team didn’t want to even know Baldwin or any other American rider but because of Aika’s control, Baldwin was hired. In 1981 Baldwin, with fellow American racing great David Aldana, raced the FIM Endurance championship for the French Honda team on an aging RS1000, an inline four that, according to Baldwin, “… blew up every time we started it.” In Europe in 1981 Baldwin saw Aika and the Japanese executive slyly told him, “Next year we have new bike in America? 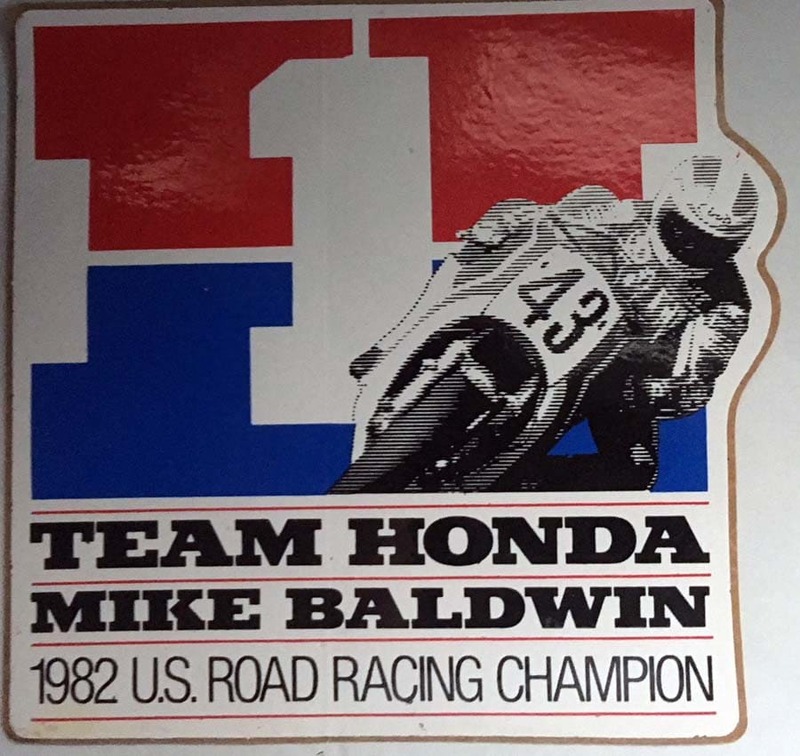 you ride?” For 1982 Aika convinced American Honda that they should hire Baldwin to lead their US Formula One effort. Baldwin begins his FWS1000 remembrances by saying, “It’s my all-time favorite bike. If they would have let me have one bike, that would have been it. It was a great bike. I bought several RS500s from Honda and won one on a bet, but the FWS is the bike I really wanted.” The first FWS was rolled off the truck for the first time at a secret Honda test at Daytona before the 1982 Daytona 200. The RSC (which would later become the much feared HRC) GP group was split into two distinct factions then – four stroke and two stroke. The two-stroke group debuted the NS500 Triple in 1982 and then it was the four stroke’s group to show their stuff. The FWS’ first race was the 1982 Daytona 20 with Baldwin and Freddie Spencer aboard the exotic Honda V-four, with foes Kenny Roberts on the Yamaha, Eddie Lawson on the always suspect Kawasaki KR500 and eventual race winner Graham Crosby on another Yamaha. As always much of the race came down to tires: Baldwin states, “Michelin had three tires, all of them really hard. They came in a soft/hard, medium/hard and the hard/hard. The hardest compound would easily go 200 miles. Hell, it would go four or five hundred miles probably. But it had no traction to speak of. If the sun was out and it was a warm day, by about the fifth lap you could just start to lean the bike over. If you did that before the fifth lap you’d crash. Especially in like the old Horseshoe at Daytona where the surface was really polished and slippery. You’d have to give it eight or ten laps to warm up. So Freddie and I agonized over which tire we were going to use and I think we both decided on the medium/hard compound. We had to, if we used the hard everybody would clear off and we’d be lost. You didn’t schedule a tire stop back then; you just had gas stops, no quick-change. So your tire choice had to be right on.” The pace of the race was hard for the first ten laps and did the tires in. Baldwin continues, “It wasn’t spinning coming out of the corners like most of the bikes did then, it was spinning all the way down the straight, it was spinning at like 179-180 mph. The FWS had a huge frontal area, and I think it was just impossible for the bike to push through the wall of air in front of the fairing. It was like you parked the bike against a wall and did a burnout; it had good power but not enough to overcome the aerodynamic deficiencies of the bike, so the tire just spun. Bikes now and then normally hit top speed just after the finish line at Daytona but the FWS was topped out long before that.” Baldwin won the 1982 AMA Formula One championship on the FWS, winning Loudon, Pocono and Sears Point. Wes Cooley Jr. won Road America on a Yosh Suzuki and Roberts won his home race at Laguna Seca. Future clergyman Steve Wise finished second in the championship. The FWS’ in America were nearly the only ones raced in the world. “After Daytona we went over to England to do the Match Races (then held each year at Easter),” recalls Baldwin, “and we were ready to pack the FWS up and do it, but the British organizers were really upset that we were going to bring the FWS over. So we ended up bringing an old in-line four bike. I think that they wanted a Brit to be the first one to ride that bike in the UK. Honda gave one to Joey Dunlop and he won the Isle of Man on it. He just annihilated everybody on it.” In 1982-83 FWS appearances were very rare outside of America and the Isle of Man. Then a newby Honda mechanic from Colorado, fresh from Honda’s enduro and dirt track program, and now engine builder and crewchief of the Smokin Joe’s Honda AMA Superbike team Ray Plumb remembers the FWS with glee. “It was my all-time favorite race bike. It was a great bike, easy to work on and dead reliable, you could not screw it up. The engine at that time was really advanced – it was a 996cc DOHC, gear driven v-four, with rocker arms no less, titanium rocker shafts and a full stainless pipe which in 1982 was rare even on a factory level. It was one of the first bikes we had titanium connecting rods in. One of the neat things about it was that the back cylinders were a one-piece cylinder liner fitted into the aluminum block with o-rings on the top and bottom of the outside of the liner. From a machinist standpoint that was really something. It also had one of the first one-way clutches and a predecessor to the clutches we now use on Superbikes. The rear exhaust turned up out of the exhaust port towards the seat then turned right, then turned left and then ran back to the tail section. It was a plumbing nightmare and a mechanic who was here then, who shall remain nameless, looked at it and said, ‘There’s no way that is going to work’. But it did, it worked great.” Plumb states that the FWS was one of the first full-on works bikes that American Honda received from HRC, prior to that they were building most racebikes on their own with components coming from Japan. The FWS, although it was not the most successful HRC/RSC/HGA racer in history, was the forefather of the entire line of v-four racing and sporting street motorcycles including the first 1983 VF750 Interceptor, the later VFR700/750, the RC30, the RVF750 endurance racer and the current RC45. In addition, the methodology used in the cylinder liner is the same as used in the $50,000 NR750 streetbike. Only now, years after the project was started, has Honda built a non-v-four machine (the VTR1000) that can be considered a platform for a serious factory level racebike. The FWS that Baldwin rode to his Formula One championship now sits in the Honda museum beneath the Suzuka racecourse in Suzuka City, Japan.